In 2013, Glasgow City Council won £24 million worth of funding from Innovate UK (formerly the Technology Strategy Board) that would see the city become a ‘living lab’ for smart city projects. 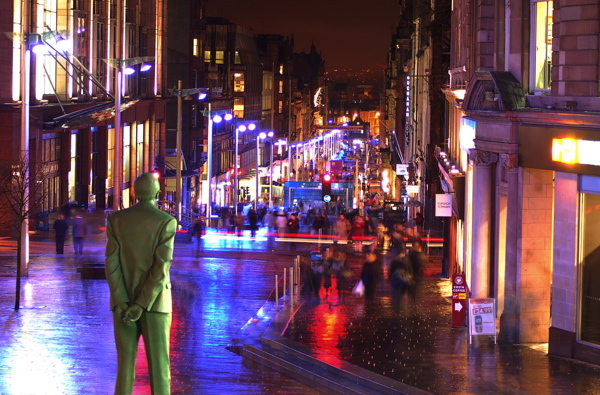 Although Glasgow has been more synonymous with low life expectancies (the so called ‘Glasgow Effect’) and urban deprivation, the funding was intended to transform Glasgow into a world leading smart city, with the technologies piloted by Glasgow eventually being used in other cities. The projects proposed by Glasgow City Council were designed to explore innovative ways to use technology and data to make the city ‘safer, smarter and more sustainable’. However, three years on, with the majority of the work complete, has the programme been a success? From the beginning, Future City Glasgow set out an ambitious programme for change. However, it wasn’t just the experimental nature of the technologies or implementing them in such a short space of time which caused challenges. The programme also had an important role to play in the security of the 2014 Commonwealth Games – a major international event for the city. Just under half of the programme’s funding was spent on a new state-of-the-art Operations Centre, integrating traffic and public safety management systems, and bringing together public space CCTV, security for the city council’s museums and art galleries, traffic management and police intelligence. Although this has required significant investment, the centre has enabled Glasgow to take a ‘proactive’ approach to traffic management and public safety. Video analytics tools, for example, provide operation centre operators with better information to help respond to emerging events. And traffic operators have control over the city’s signalling, allowing them to prioritise late-running public transport. CCTV cameras have also been upgraded to full HD, providing better images for operators and an important source of evidence for Police Scotland. Intelligent street lighting – the Riverside Walkway has lighting which switches on when people walk by, and Gordon Street has lighting which provides real time data on noise levels, footfall, and air pollution. Sensor technology in retrofitting – low cost sensors (the BuildAx and the Eltek GC-05) have been deployed in buildings throughout Glasgow to evaluate the impact of insulation projects. The Glasgow Cycling App – an easy to use platform has been created to encourage cyclists to share their experiences of cycling and to generate data that could help citizens plan journeys or highlight areas the council should target for improvement. Much of Future City Glasgow has been underpinned by data sharing – including traffic data gathered by the Operations Centre and citizen-generated data from the Glasgow Cycling App. After some awareness raising and reassurance, the Glasgow Data Launchpad, a publicly available repository for the city’s data, now has over 400 datasets from 60 organisations, including Glasgow City Council, Glasgow Life (which delivers cultural, sporting and learning activities on behalf of Glasgow City Council), and the Department for Work and Pensions (DWP). However, it’s important that the city doesn’t become complacent and continues to progress with smart city initiatives. Alan Robertson, in an article for Holyrood magazine, suggests that financial pressures facing local councils may put initiatives in jeopardy. For instance, he highlights that Glasgow City Council leader Frank McAveety has warned that the city faces “impossible budget cuts”. There are, however, some positive signs that work will continue. Last year, the Scottish Government introduced Smart Cities Scotland, a new programme which aims to make Scotland’s cities more efficient and greener, and more attractive to potential investors. The programme received £10 million in European funding and will involve a collaboration between Scotland’s seven cities and the Scottish Government. Future City Glasgow has had many successes since it was launched three years ago. Although Smart Cities Scotland promises less funding, Future Cities Glasgow has provided the smart city infrastructure capable of supporting new projects. In terms of driving growth, it will also be interesting to see how Glasgow City Council responds to new forces within future cities, including disruptive business models and technologies, such as controversial tech companies Uber and Airbnb.